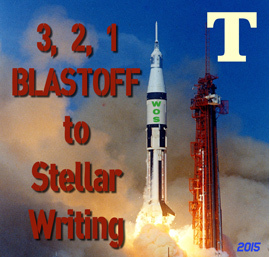 Writing a book is not as labor intensive as, say, launching a space mission, but sometimes it feels like it is. I use Trello to keep my sanity in check. It helps me manage all my brainstorming, to do lists, blog posts, home repairs, work deadlines and even my kid’s schedules…all in one place. And best of all, the basic version is free! 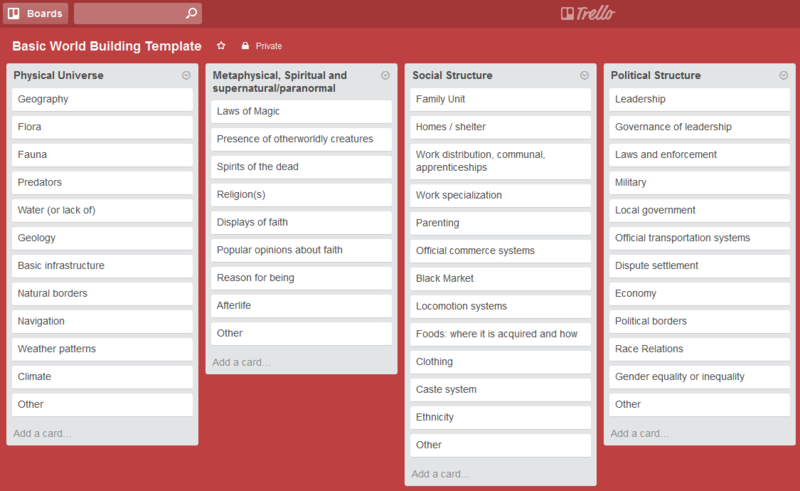 I wrote about Trello a few months back in the post 5 Reasons Why Every Writer Needs Trello, but since I’m still learning new ways to use the program, it looks like I have a lot more to say on the subject. Trello makes outlining easy. Like most writers, I keep a corkboard and it’s covered with plotting index cards, character relationship maps, blueprints of my settings, inspiring photos, etc, but it’s only for my current project. I don’t have the space to keep two or three project boards in my office. But I can keep 100 boards on Trello, one each for the ideas, inspiration, characters or plot notes of every writing project I’ve ever dreamed of. I used the 3 act structure to set up a my boards. First I created a basic template with a card for each of the common story elements. I also threw in an other card at the end of each column to catch any oddball items. I can always adjust the board parameters as my project progresses. Once I have a template board set up the way I like it, I can quickly create a new board for a second (third, fourth, fifth) writing project. This saves time and makes plotting a simple process. I love watching a plot take shape on Trello and I can’t miss any of the important story milestones (inciting incident, pinch points, or midpoint reversal) because the cards in my template keep me on task. Trello is perfect for world building. When sci-fi, fantasy or historical fiction writers start to flesh out their worlds, it gets complicated. We need to keep track of all the aspects of the setting: the political system, geography, flora and fauna, social structures… it’s file folders and notebooks full of raw data. Some writers use spreadsheets like Excel to streamline the process, but with Trello I can see the data more clearly. Plus the entries click open for more options. I can add links, make notes, create to do checklists, and upload research notes and add photos for inspirations. It’s like having Pinterest secret boards, but with more options for storing written data. The flexibility makes it extremely helpful for planning a series. I can create one board for each book, or keep track of all the series threads on one board to make sure I’ve created a cohesive series. 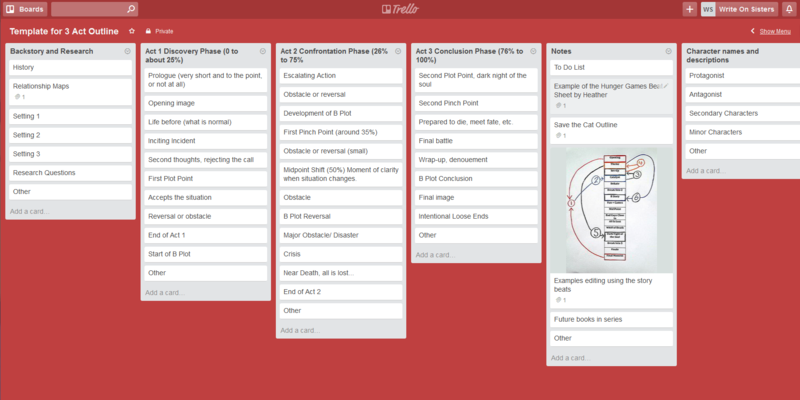 Trello streamlines the editing process. This is something I’d never thought of doing, but once I saw another writer doing it, I was convinced. Trello boards make an ideal place to keep my self-editing checklists and to track the revisions. As an extra bonus, I can upload chapters and invite other people to read and comment on them. This makes Trello perfect for online critique groups. I can sit back and watch as each beta reader marks the project read and adds their notes. Plus all the readers can have access to the comments leading to group discussions. The system makes it a great way to work closely with a remote editor or to get feedback from a writing partner or an agent. Best of all, I control who sees the boards on a project by project basis. I can set a board to unrestricted public viewing, or invite members into my group. The Page Turners blog did a great job on showing how to use Trello with a remote editor. If you want to use Trello for an online critique group, I highly recommend this post. If you want to use Trello for day-to-day management or just want a basic crash course try this How To Post from LifeHacker. This is already a link-heavy post, but the last one you might need is the Trello Blog. This is the best place to find out what other users are doing with their Trello boards. It might surprise you. Everything from designing a book marketing campaign to planning a new author blog is easier with Trello. This looks really cool. I’ll have to give it a try, although I only have a netbook and I might go crazy not being able to see enough at once. That’s already a problem, and why I have most of my development stuff on big trifold boards and monster pads of paper… I like seeing everything at once all the time, and even with a big laptop I might not think the screen was big enough! Ohhh!!! You have just made me SO happy!!! This is going to be an amazing inspirational tool! Thank you!! I’m excited to see so many people talking about giving Trello a try. Let me know how you like it. Trello sounds awesome and useful. I’m going to look into it and perhaps give it a try. Your enthusiasm for it is palpable. I am a fan, but I’m also a busy human. I guess I need to learn how to say no more often. : ) I honestly think people should use whatever works best for them, but I think if you give Trello a try you will like it. Just the ability to access and add to your notes remotely makes it worth using. You’ve convinced me! Just signed up for an account. Cool, it would be great for Feminist Friday organization. You could run drafts and ideas by the group of members to collaborate on or give feedback and comments on before posting. This sounds like what I’ve been searching for. I certainly need a new way to organize things and since I’m into my computer most of the day, I think this would work very well. I think you will love it. It’s a great way to organize blog posts. Or keep track of book release dates. It looks like something worthwhile, once you’ve invested the time in setting it up. I’ll take a look at it. Thanks for the info.